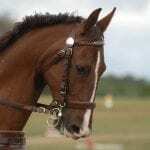 It’s seldom “just one thing” that causes a problem for your horse. I was inspired to write this little note by a post I ran across called “Trigger Stacking.” It’s a great quick read about how one thing going wrong usually won’t cause a problem, but when it’s combined with several other factors, things can get… exciting. He must have gotten stung by a bee! If I had a nickel for every time I’ve heard about an accident that involved those words. It seems that if a horse that someone knows and loves does something out of character, the explanation must be that he got stung by a bee. What else could possibly explain why that horse suddenly took off in a bucking runaway? The truth is, when a horse acts out, it’s usually a combination of many factors. There were usually warning signs along the way that were overlooked or outright ignored. I’ll give you a very real example of this from very early in my career in carriage driving. I had just finished a nice drive with a Clydesdale who was one of the sweetest, most reliable horses I’ve ever had the pleasure of knowing. I was unhitching her while chatting with a couple of my coworkers. Suddenly a tennis ball zoomed by on the ground with a little Jack Russel in hot pursuit. That lead to a chain of events that ended with the carriage literally half way up a tree. It would be easy to lay the blame squarely on the person who wasn’t thinking when she threw that ball for the dog. After all, if that hadn’t happened, the horse would have never spooked, and we wouldn’t have had to figure out how to extract a broken carriage from a recently planted tree. But the truth was a bit more complicated than that. The most dangerous part of any drive is hitching and unhitching. 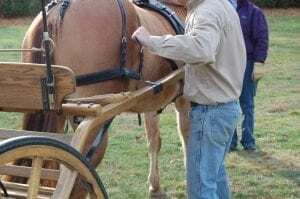 At some point during that process, the horse will be partially hitched to the carriage. If the horse moves at that moment, things can get weird… really fast. Since I was distracted by the conversation at hand, I wasn’t fully focused on the act of unhitching the horse. In those early days of my career, I didn’t fully appreciate the importance of following safe hitching and unhitching sequence (I was about to get a lesson though!) I had the traces unhitched before taking off the breeching hold back straps. When the bouncing ball and the darting dog appeared, the horse really didn’t have a big reaction. She just popped her head up in surprise, and took a step back… which started the carriage rolling back away from her. Marathon carriage hitching order on youtube. We said “Whoa” which she did… but the carriage didn’t. The shafts fell out of the tugs and hit the ground, giving the horse a little jolt in surprise. Since she was still attached to the carriage by the breeching straps, she pulled the shafts into and under her legs. Now she was off to the races with a partially hitched carriage. As she zoomed by a skinny young tree, one shaft went on the wrong side. That sent the carriage up the tree like a Hollywood action movie scene, rolling over, upside down at the top of it’s arc, pulling the tree down with it. Fortunately, the hip straps of the harness broke, freeing the horse from the mayhem. She continued to run until she landed on the choicest manicured lawn on the property, dropped her head and enjoyed a snack. Experience is what you get when you were expecting something else, and I had unwittingly set myself up to gain some experience. I wouldn’t have this story for you. Sure, if the ball and dog never appeared, the accident wouldn’t have happened. 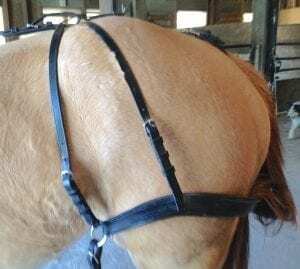 But, it took several other missteps for it to lead to broken harness and a runaway horse. You don’t have to have these experiences to learn from them. You can keep things from getting out of hand by staying ahead of the action. Here are a few tips to do that. There are a lot of moving parts when it comes to the tack and equipment that we use with our horses. When we involve a carriage in that scenario, the number of parts increase exponentially. It’s easy to assume that the tack and carriage that you’ve been using regularly is working just fine, but it’s easier to overlook equipment breakdowns than you think. Other than the poor fit, this breeching looks normal. Hiding in plain sighte was a piece of broken harness! That breakdown alone wasn’t enough to cause a problem. 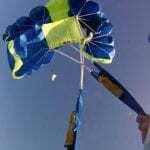 However, if there were one or two other problems that occurred while that harness was in use, the issues could have easily stacked upon one another to cause a major issue. This harness breakdown came up when I was cleaning the harness. That’s usually the time that we catch these issues. Regular equipment maintenance not only makes the gear more pleasant to use, it keeps you safer! It’s rather easy to to overlook simple errors when you’re not on the lookout for them. For example, did you catch the repeated word in the previous sentence? Following methodical steps when you are working with your horse can ensure that you don’t miss important details. When I’m hitching or unhitching a horse, I always follow the same sequence. That ensures that I’m correctly hitched and I’ve checked all of the pieces of equipment for proper adjustment before I get in the carriage. When I get back from my drive, I follow the exact opposite order of operation to be sure I’m unhitching in the safest manner possible. 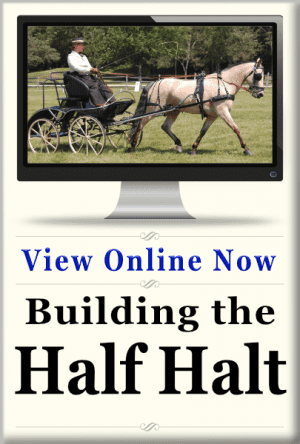 Being methodical doesn’t just apply to how you maintain your equipment and how you hitch your horse. It applies to your training as well. 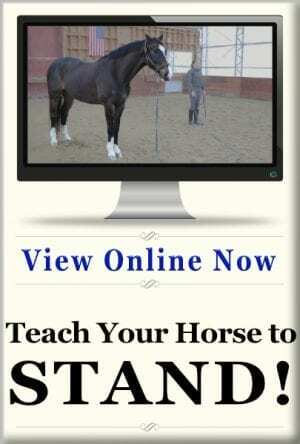 Teaching your horse to stand completely still during hitching and unhitching is paramount to your safety. The best way to accomplish that is through methodical training and practice that starts in the barn. 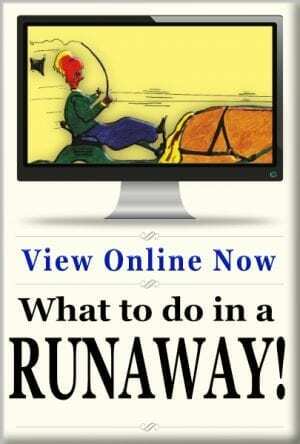 That training should carry through to not only the hitching area, but in your day-to-day driving as well. Too many accidents happen after someone has completed a hazard or cones course because a horse doesn’t have adequate training to slow and stop when they are told. This is something that should be addressed and practiced at home under controlled circumstances. 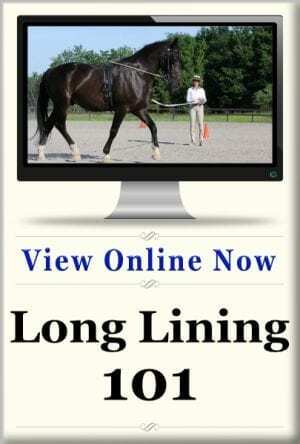 You can methodically practice bringing your horse to a walk and halt from higher gaits at home. Just as the stand training starts in the barn, this training should start with low energy, and build upon success as you go. I’m not advocating that you train an “emergency stop” into your horse. That can create it’s own set of issues. 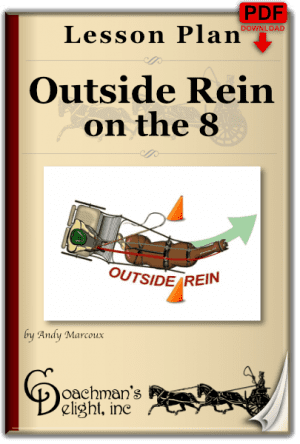 Instead, look for an efficient and organized transition through the walk to the halt without resistance from your horse. Alas, this is probably the hardest thing to teach. Often times when a series of events have stacked up enough to cause an accident, many of them have gone unnoticed. You have to use all of your senses the whole time you’re driving. If an unusual sound comes up, or the carriage “feels” different, it could be the sign of trouble brewing. The big takeaway from this post should be that you have the opportunity to stay ahead of these issues. You can’t realistically control everything that happens, every time you take your horse out. However, you can stack the deck in your favor. Take the time and effort to be methodical in your training, and driving. 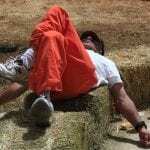 You may just be protecting yourself from the trouble that the last straw can cause! If I had only turned around and gone home first, to a secure location…. If I had only done a lot more work on STAND and WOAH…. If I had only given more thought to some of her behaviors that she used to try and show me she wasn’t in a good place for driving…. Yep, I had a lot of things that I should have paid more attention to and definitely were a direct part of our accident happening. Six months later, it was very clear she wasn’t still traumatized by the experience. At 15 months, I tried to simply walk her in that area. She was a mess. Just a walk with halter and lead. She couldn’t do it. My mistakes brought this about. Its unlike she will every be asked to drive again, but I do plan to work with her so she’s at least comfortable taking a walk. I owe it to her and myself. 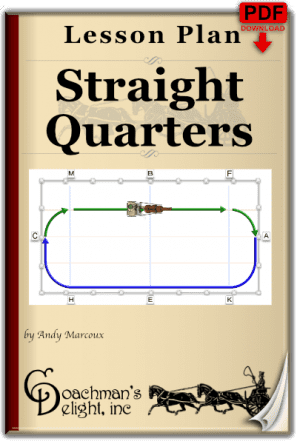 Thanks again Andy for this great resource you’re providing! 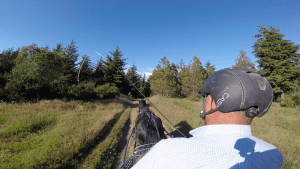 This post kind of got me thinking of some very basic safety precautions I was taught when I first started learning to drive – always have a groom stand with your horse while you hitch or unhitch. Course like most drivers I’ve since found myself having to do it on my own (or just not drive at all – which I don’t want to do). But what I always do if there’s no groom is make sure the horse is secured by its head collar before putting to or taking out of harness – this seems to me basic common sense as at least it gives you a couple of seconds to do something before your horse takes off up a tree. Many people seem to have forgotten the literal definition of the common term “hitching post.” I had a student for years who always used a hitching post when she put her horse to. She always drove with a halter over the horse’s bridle, and had cleverly set up the tie rope with a slip-knot such that she could release the rope from the halter after she mounted the carriage. 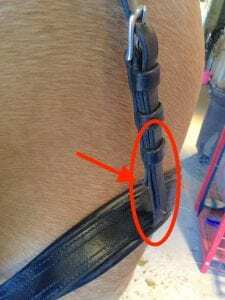 Many people are afraid to have their horse tied while hitching because if the horse decides to resist the tie and panics, things can get ugly. But that begs the question, why would a horse who’d been trained to tie suddenly decide to resist the tie? Lot’s of people drive on their own, advisable or not. Let’s face it, if we all had to wait for a second set of hands to drive, we’d drive a whole lot less. Personally, I won’t drive a horse that I can can’t walk a full circle around, hands-off without the horse moving. That’s the whole point of my Stand Training. I don’t use a hitching post or halter, because I’ve put the safety training into the horse. That doesn’t mean that it’s 100% perfect. Your method, as you say, grants an extra safety measure that can make a big difference.